11991: unmarked desk pencil: long and elegant, gold filled trim with twist pattern black hard rubber barrel sleeve, 15.1 cm long, propels and retracts, uses 2.65 mm lead (lead clutch could be squeezed slightly to allow use of more readily available 2.5 mm lead). 11202: unmarked dip pen: sterling silver, American manufacture, marked only "STERLING"; bold twist decoration of fine quality, 15.5 cm long excluding plated steel nib. 13676: unmarked dip pen: sterling silver, 16.1 cm long, marked only "STERLING", American made, high quality, seam opening at front of nib holder does not affect function. Ex-Tefft collection. 11622: unmarked dip pen: sterling silver, 15.9 cm long excluding brass nib, American manufacture, excellent quality, nicely proportioned twist and scroll pattern, a few shallow bumps to the ferrule (see detail). 13014: unmarked dip pen: sterling silver, 15.1 cm long excluding steel nib, American manufacture, excellent quality, unusual coil-pattern body. 12820: unmarked dip pen: sterling silver twist pattern, 16.8 cm long excluding plated nib, probably American manufacture, engraved only "G.G.E", apparently a monogram rather than a maker's mark. Excellent quality. 13678: unmarked dip pens: sterling silver, beaded decoration, marked only "STERLING"; sold as a pair, though it is noteworthy that even these seemingly identical holders differ slightly, an indication of the hand work still required to finish die-stamped components (one is 16.2 cm long, the other 16.1). These appear to be new old stock, evenly tarnished, with a few very shallow storage bumps. 12771: unmarked double-ended pencil: slender hexagonal silver barrel with colored casein cones on either side, 13 cm long, hallmarked "835", probably German manufacture, uses 1.1 mm lead. 13365: unmarked extending pencil: slender slide-action, gold filled, finely engine turned, 8 cm long closed, 10.4 cm extended, uses 1.05 mm "M" lead, probably American manufacture, with characteristic steel nozzle insert, unmarked nozzle. Clear faceted seal stone, cracks at ends of slider slot (see details). 13954: unmarked extending pencil: 8.5 cm long closed, 11.1 cm extended, uses 1.0 - 1.05 mm lead; construction appears to combine gold filled and solid gold components, typically American nozzle with inset steel tip. Some scratches to sides of nozzle body, crack and missing material at front of slider slot (see detail), faceted yellow end stone. 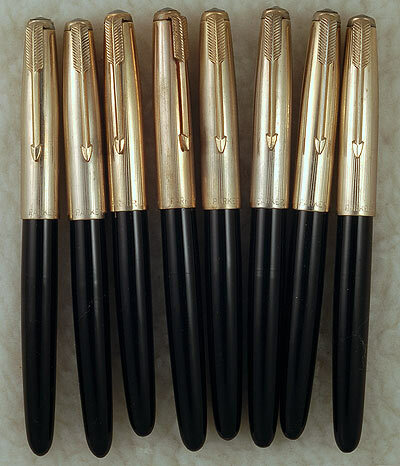 13063: unmarked extending pencil: early slide-action, gold filled, American-made with characteristic steel nozzle tip insert, sliding ring fitting, 9.7 cm long closed, 12. 7 cm extended, yellow faceted seal "stone", uses 1.0 mm lead. 10656: unmarked extending pencil: slender, 8.1 cm long, 10.3 cm extended, yellow seal stone has chip on rim, metal crisp, noting short area of seam opening at front of slider slot; nozzle marked for "H" lead, appears to be English manufacture though not hallmarked, and of solid gold with no sign of wear-through. 11952: unmarked extending pencil: sterling silver, English manufacture, hexagonal shaft, 7.6 cm long closed, 11.3 cm extended, shield-shaped moonstone seal stone, unusual with extra section of telescoping hexagonal shaft. Uses 1.05 mm "M" lead, fully functional noting nick to nozzle tip, small stress crack at front of slider slot, and absence of one of the two pins securing the sliding collar. 13664: unmarked extending pencil: distinctively French design, two-tone gilt over silver, though no metal content marks visible; 10.2 cm long closed, 13.3 cm extended, perpetual calendar at end, seal engraved "G.F", scroll engraving on barrel, nozzle accepts lead from .9 to 1.0 mm. 9877: unmarked eyedropper-filler: black hard rubber straight-cap, 11.65 cm long, overlay marked "18K" on both cap and barrel, but appears to be gold filled. Excellent quality, like new condition, warrnted nib somewhat toothy. 13183: unmarked glass dip pen: clear glass nib, hand made, 14.3 cm long, rolled paper advertising sealed inside hollow glass handle, for Springfield, Missouri insurance company. 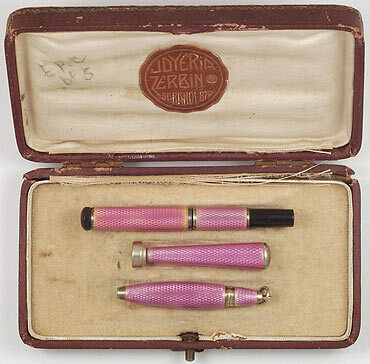 13955: unmarked magic pencil: gold filled ringtop with pearl slabs, 4.7 cm long closed, 8.5 cm extended, uses 1.0 - 1.05 mm lead; some marring to nozzle tip which does not affect function, one pearl panel is an old replacement, well matched as to color but with a flat surface rather than rounded. 12230: unmarked magic pencil: gold filled ringtop, hexagonal red and white marbled celluloid barrel, 4.75 cm long closed, 9.2 cm extended, uses 1.05 mm lead; usual seam openings to celluloid from age shrinkage, otherwise good clean condition. 10747: unmarked magic pencil: large gold filled ringtop, 5.7 cm long closed, 11.2 cm extended, elaborate twist pattern barrel is thick and substantial; uses standard 2.0 mm thick lead, smooth mechanism, possibly made by Hicks. 10895: unmarked miniature safety set in box: beautiful ensemble, German manufacture, purple transparent enamel over silver. Black hard rubber safety pen is 7.2 cm long, fully functional, and appears never to have been used (we have replaced its cork seal and repaired a small crack in the internal spiral). The magic pencil is 5.25 cm long and bears an 835 silver content stamp on its ring; shaft and nozzle are gold-plated, and it uses standard 1.1 mm lead. The enamel is intact on pen and pencil, but is damaged on one side of the matching wax seal (see detail). Box is marked "Joyeria Zerbino", a retailer in Montevideo. 12681: unmarked novelty pencil: nickel plated brass and celluloid, in the form of an antique pistol, 5.1 cm long, 6.1 cm with nozzle extended; barrel twists to extend nozzle, lead propels and retracts, uses standard 1.1 mm lead, celluloid "stock" has one small chip at the back, material very likely of German manufacture. 12295: unmarked novelty pencil: nickel plated brass, 6.7 cm long, in the form of a screw; the head turns to extend and retract the lead. Uses standard 2.0 mm drafting lead, Cross made similar pencils, but could also be English. One small stress crack near front of threads. 11943: unmarked pencil: slender, barleycorn pattern with what appear to be traces of gilding (material appears to be solid silver and not plate), 9.3 cm long, uses 1.4 mm lead, probably American. 13397: unmarked pencil: black hard rubber ringtop with sterling silver trefoil filigree overlay, 10.9 cm long, excellent quality but marked only "STERLING", could well be a Boston or Edward Todd product; uses standard 2 mm lead, "H" engraved lightly in cartouche. 11024: unmarked pencil and pencil topper: small sterling silver ringtop, uses standard 2 mm lead, 6.6 cm long, with similarly marked silver topper for a wooden pencil -- chased sleeve slides up to hide eraser, has some roughness and a small split at the top edge (see details). Both pieces probably New York manufacture. 9970: unmarked safety: miniature black hard rubber retracting-nib German safety, 8.35 cm long, engine-turned silver overlay marked only "900" at the center of the cap crown; despite size, a fully functional pen, cork has been replaced, 14K gold warranted nib has considerably flex, but due to dimensions line width variation is limited. 10566: unmarked safety: black hard rubber, vest pocket size with silver overlay with grouped parallel lines pattern; 10 cm long, French made, small 18K warranted nib is smooth and opens up with the slightest pressure; a couple of small dings to the top edge of the cap overlay, internal spiral has been repaired. 13016: unmarked sheath pencil: gold filled ringtop, crisp engine turning of unusual design, 8.8 cm long closed, pencil uses standard 2 mm lead, advances and retracts, crisp and clean, one tiny test mark towards front of sheath. 12229: unmarked sheath pencil: white metal, 10 cm long, Egyptian-themed enameled badges applied on each side; dings overall, corrosion hole in holder (see details).